In this day of mass farming, where millions of chickens are mistreated for the almighty egg production market -- you will be doing your part to humanely supply cage-free, well-loved chickens with a compassionate (they will get hugged daily!) and peaceful home in order to provide people with the ultimate ethical egg. Not only will they be cage-free, they will be outdoors (free-range) during the day. How/when the money will be spent: Your contribution, no matter how small, is sooooo very appreciated. 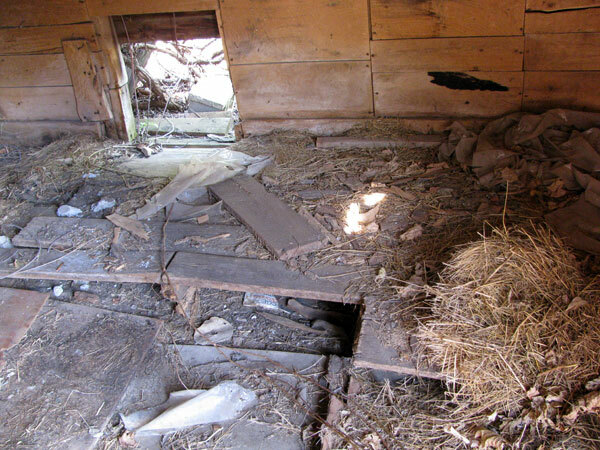 We need to rejuvenate this old coop with a sealed floor to keep foxes out, a new outdoor run to keep the hens in, and nesting, water, and food stations. We also need to purchase beautiful Road-Island Red Laying Hens. My family and I will put in all the construction hours for free, and document the process in photos/video for you. ***** The Kindness Poacher: Every penny counts -- donate any amount from $1-$24, as your pocket book allows. Reward: inner peace knowing that you did your part to make sure that hens are living a full, fresh-air and active life. ***** The Sunny-side-up Eggs Benny-factor: Donate $25. Rewards: as above, PLUS a hen named in your honour, and a photo of ‘your’ hen. 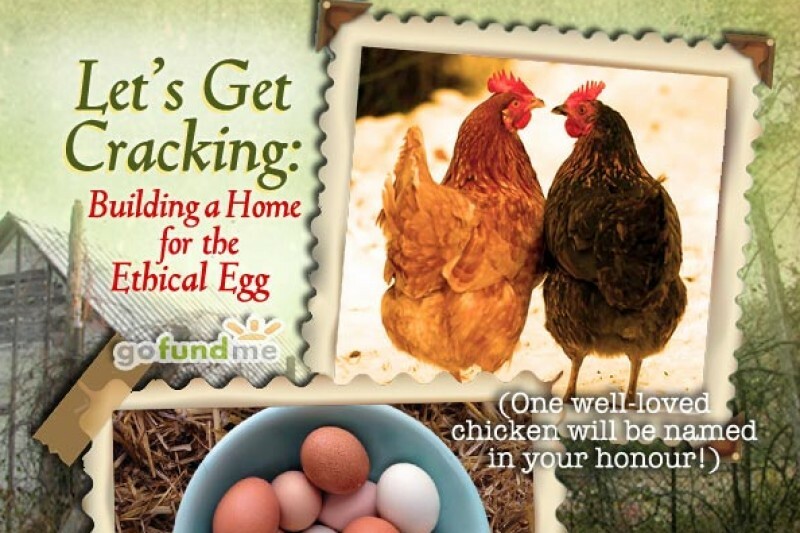 ***** The Egg'cellent Philanthropist: Donate $100. Rewards: everything as above, PLUS your hen’s footprint/name immortalized in the cement walk-way of fame! ***** Got another category in mind? Send us a message to propose something! A little back-story on the farm where the coop is: The farm is a nearly-300-acre, 1860 property on the edge of the Ottawa Valley, in the farmlands of Perth, Ontario, Canada. Following the death of my father a decade ago, my mother decided to open a B&B as a way to stay there. Sadly, this venture failed and lead to a situation where my mom was at risk of losing the farm. We (me, my hubby, and family) have stepped in to help, and have come to an agreement with bank and township to get the property back on its feet. We are slowly turning it around but everything takes time and elbow grease. Having grown up on this farm in the 1970s, I am not afraid of hard work — it’s the raising of money that is the hard part. We’re committed. 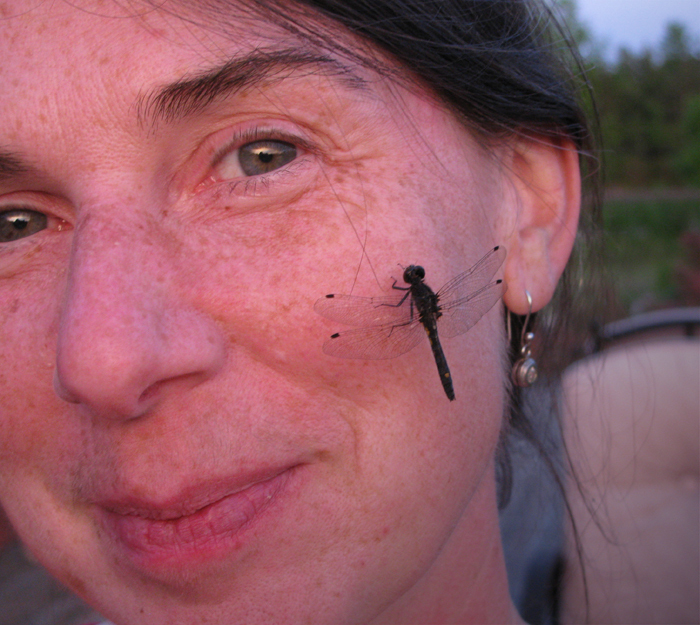 We’re 2.5 years in and are well on our way to becoming part of the local studio tours, turning it from a 'retired' farm to a small mixed-farm with laying hens and market gardens, protecting the forests and ponds as wildlife sanctuaries, and developing art installations along paths throughout the acreage. I would be happy to keep you updated and send you an invitation to future events. If you are not yet on my e-mailing list, I hope you will subscribe here. COOP UPDATE: As some of you know (those following on Facebook), while working on restoring the old coop, we discovered that the floor has something like a dry-rot. 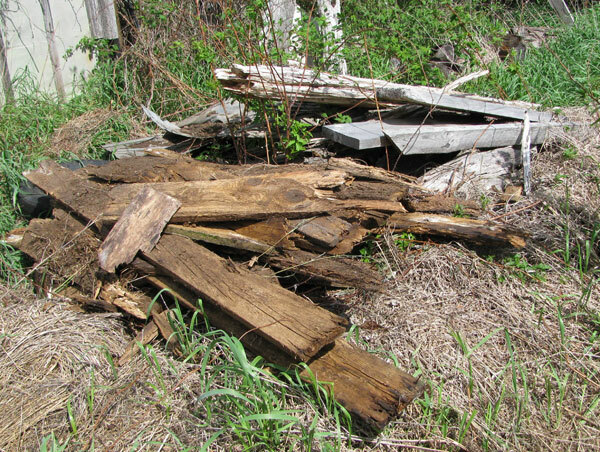 The boards were intact and looked good but they were very weak and easily stepped through. So, one step backwards (gently!) in our plans. That's okay. Surprises happen; we roll with it, right? :) It means figuring out how to rebuild the floor, which delays things but keeps life interesting! It's all worth it because we want our future hens to be safe, and we know that you do, too. 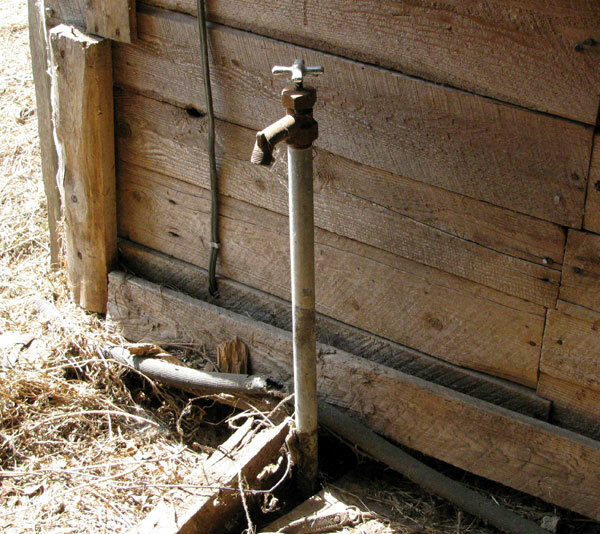 Coop Update: There used to be running water inside the coop, as this tap indicates. It is not currently working. You'll note that mice chewed through the black hose. Mom also thinks that heavy machinery drove too close to the coop and crushed an underground pipe at one point. We won't need running water until next year so we won't put time into investigating that now. Surprise! While cleaning out the old coop, we found a bunch of wasp nests that we'll have to deal with. We also found this skull and 9 bones of a... ? raccoon? Anyone know? 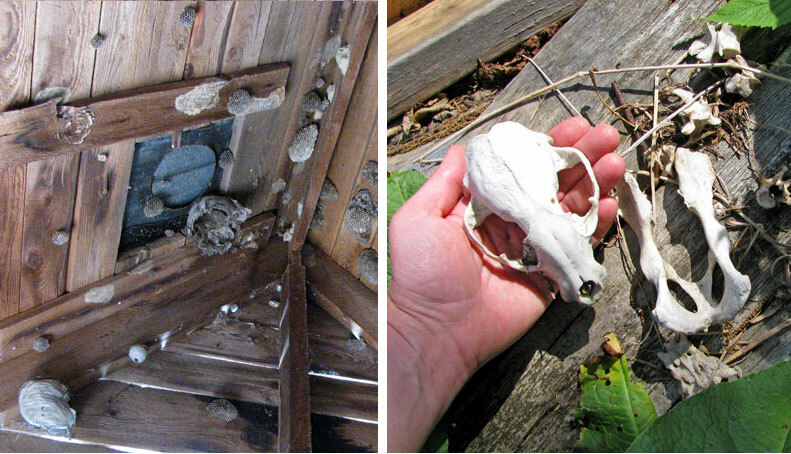 Wasp nests and raccoon (?) skull. I like the way you think about what's of great value in life. Coleen, instead of using my name, could you call her Cupcake which is the name of my last little rescue here.